Learn about patxaran and help to make your own bottle with the aid of an expert. 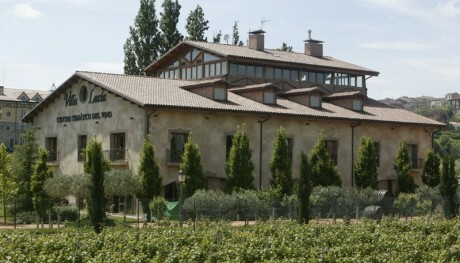 Visit the winery/museum and wine centre, with a lunch of local produce in the grill restaurant. We want you to discover and take part in the making of “AUPA” traditional patxaran, created in Rioja Alavesa, aided by explanations by César Sáenz de Samaniego. He'll tell you how the fruit is collected and you'll follow his instructions to make this exclusive patxaran in a special bottle. After personally labelling it and sealing it with wax you can take the result home, to try it with whoever you like after a few months of maceration. You'll also get the chance to visit the Villa-Lucía winery/museum and visitor centre and enjoy the 4D Experience “En tierra de sueños” ("In a Land of Dreams"). You'll finish off with lunch in the Villa-Lucía restaurant with a menu designed for the occasion with local produce, combined with patxaran.